First things first. Max got a good report from the surgeon this afternoon. He is where he is suppose to be at this point. He is suppose to still be sore and bruised and he certainly is. He is suppose to be walking a lot and not picking things up for about 2 more weeks at which time he will have his final recheck with the surgeon. So we came home and walked some more. Over 4 miles today. Max is definitely getting better – just not quite as fast as he would like. Anybody surprised at that?? Before taking Max to the doctor, Anne went to the dentist to get the permanent filling on the root canal from two weeks ago That was easy and no problems so hopefully she is done with dentist appointments for a while. So from home to Birmingham to home to Cullman to home. That took a lot of the day. Otherwise we worked on some accounting, did a little work in FRED and walked. It was another pretty day for our walking. 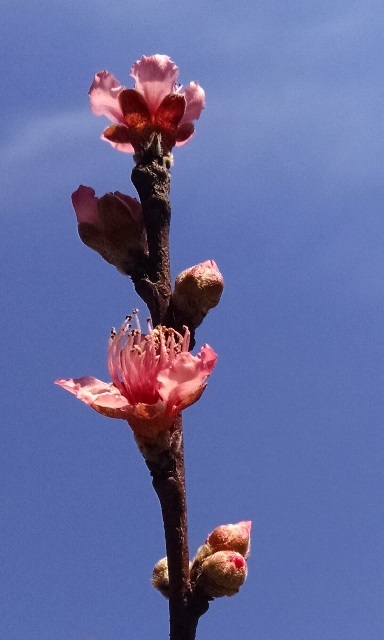 The peach tree is in bloom so maybe it escaped last week’s freeze. The blueberries are not blooming yet so we hope they also are OK.